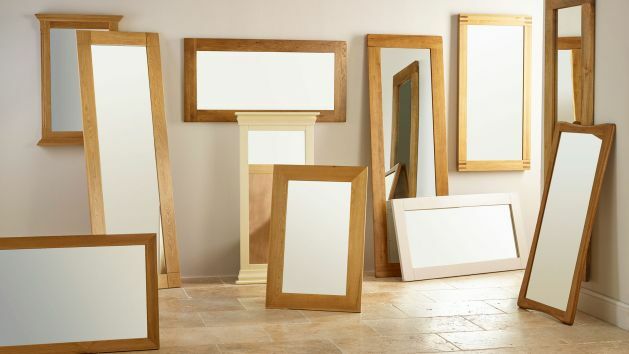 We offer a wide selection of wall and table mirrors, perfect for adding those special finishing touches to your room. A mirror is the perfect finishing touch for any room. Not only a practical addition to your space, it can also create the feeling of extra space, and even bring more light into a room. Use one of our great range of wide pieces to make a room appear larger, or highlight a particular design feature in your home. Finish your bedroom with a tall mirror to make getting dressed easier, and top your dressing table with one of our beautiful framed table mirrors. We offer a wide range in beautiful solid hardwood, which complements our furniture collections. From chunky oak cottage-inspired designs to delicate table pieces, you’re sure to find a style you’ll love. Don’t miss our beautiful mango and painted hardwood mirrors, which add visual interest to your home. And don’t forget – if you spend over £1,500, you can choose one – or one of our other accessories – as a gift from us to you.